This is one wicked samurai sword style with a full tang, highly curved and sharpened blade. The guard (tsuba) is thick steel and features a battle hardened design. A highly polished hardwood scabbard (saya) shows off complex wood grains while keeping the 1045 high carbon steel blade safe. The hardwood handle is wrapped with dark nylon cord and a red pendant swings from the end (optional, can be removed easily). This handmade katana has the most extreme curve out of our entire catalog. It is a functional sword and can be used for cutting. Overall size in scabbard: 43 in. end-to-end, 45 in. along the curve. Overall size of just the katana: 42 in. end-to-end, 44 in. along the curve. Blade size: 28 3/4 in. end-to-collar (brass), 29 1/2 in. along the curve. I bought this and was surprised to find that it is ray skin, and not plastic. Everything is great except for the saya, it has a crack in it. It was made too tight for the Katana, and the Katana was forced into the saya. Even with this flaw, I would say that this Katana is worth far more. I've had my eye on this sword for a while now, and how that I have it, I'm even more impressed. 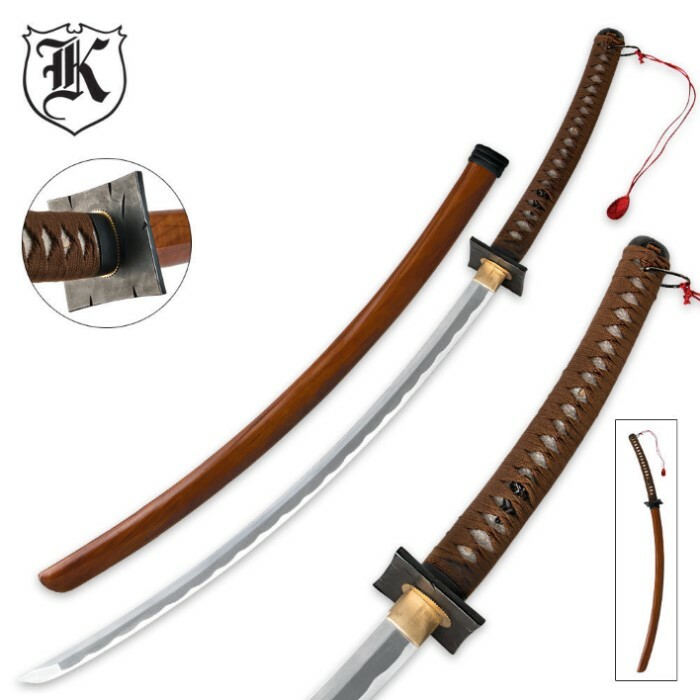 I did a bit of internet digging, and found this sword on a few other sites for not as good a price, and labeled as the "Extreme Curved Katana w/ Red Pennant" The other sites claim it is full tang, handmade, and fully sharpened, and as far as I can tell, it's all of these things. The blade is very sharp, and well oiled right out of the box, and the sword in and of itself feels as sturdy as any other battle-ready sword, but one can't fully say it's full tang without taking apart the sword (which is something I am not about to do). The saya has a very nice glossy finish, and the blade slides into it easily but not loosely. Also, to top it all off, this sword is almost an exact (but unofficial) replica of the sword Afro uses in the show "Afro Samurai" (Samuel L. Jackson voices the main character making me love this sword even more). 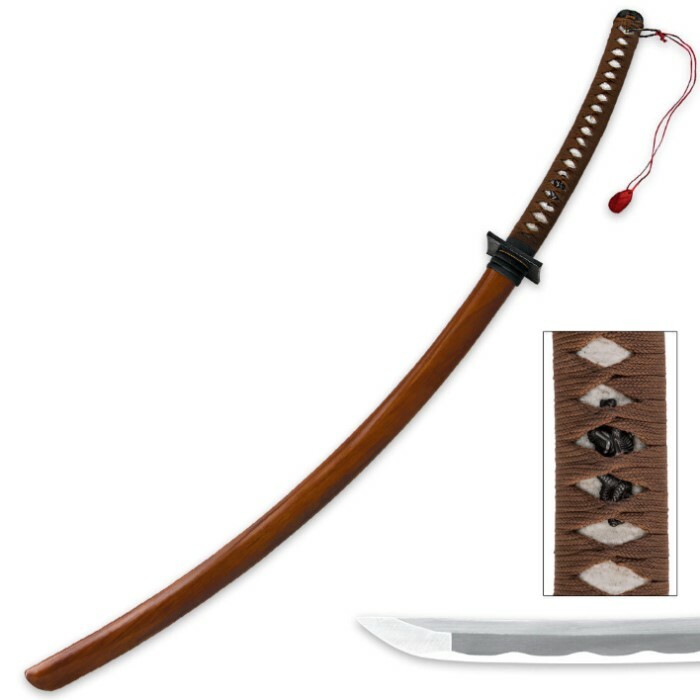 All in all an amazing looking sword of relatively high quality, and a great buy for fans of the show "Afro Samurai" or just anyone looking for a cool sword to add to the collection. 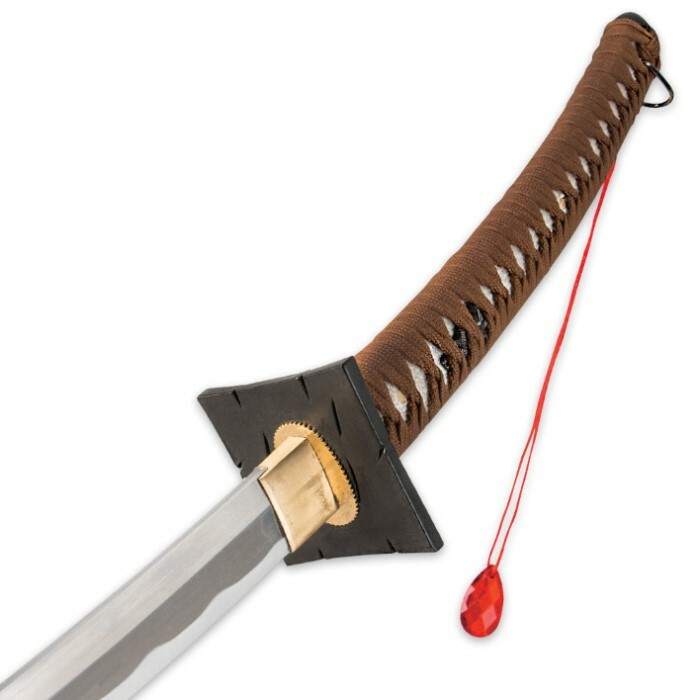 The weight length curve handle and tsuba were very well made for the asking price my only discrepancy with this product was the scabbard. While on the outside it looks very appealing inside had some sort of weird residue which kept being left on the blade every time you sheath an unsheathed the sword. Ok, so this just arrived. I always read the reviews before I purchase so thought I would put in my two cents worth. Honestly, first thing I noticed was no kurigata or sageo on the saya. But in hindsight I shouldn't of been. Re-looking at the website, I don't see one so I shouldn't have been expecting them...:) Second thing I did was take the red pendent off, guessing most people will. *S* But this thing is extreme for sure. Much more curved than I was expecting in the blade and the handle,...I wasn't sure what I was going to think of the fake battle-hardened tsuba, but now that I see it, I kinda like it..:) Love to wood grain and color of the saya and like the rubberized rings on the koiguchi. I like unusual swords and this defiantly fits the bill as something most haven't seen. I would of liked black rayskin like the pic shows, but I knew it going to be white before I purchased it,..but still the black and brown does make for a better color scheme I think,...hint-hint....LOL Over all seems well made with quality materials as advertized.